Have you been searching for your dream job? American Family Fitness is always looking for driven individuals to join our fitness family. Come be a part of something bigger! Join the team -- the American Family Fitness team, that is! We're always seeking energetic and motivated people to join our family and lead members to the best health and wellness they've ever known. With full- and part-time opportunities available, make a difference in fitness, nutrition, and childcare. Start your career with us today! Do you enjoy helping people achieve their goals? Have you always had a passion for healthy living and fitness? 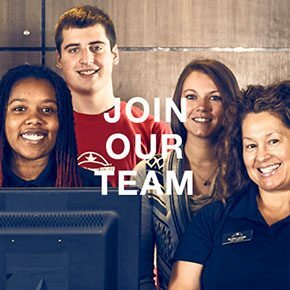 With positions available at American Family Fitness, now you can have a career that allows you to make a difference. We have nine different locations in Richmond, Fredericksburg, and Williamsburg for your convenience, and at each location we have opportunities for both part-time and full-time employment in sales, fitness, nutrition, childcare, and more. Start your career with us today! Are you looking to increase your fitness knowledge? Would you like to learn more about nutrition and the human body? 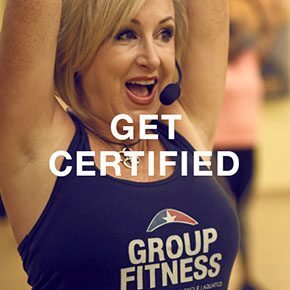 Taking the leap, and going through the steps to become a certified personal trainer, certified nutritionist, or certified group fitness instructor opens so many doors -- and having these certifications gives you the ability to walk through those doors into a world of wonderful possibilities. Venture off of the well-worn path, and start treading a new one, one that might require hard work, but one with many more rewards. For more information, contact us at info@amfamfit.com. At American Family Fitness, we are proud to offer American Red Cross trainings to members in our community. Are you looking to serve your community through fitness and a healthy lifestyle? Come take part in our swim instructor training. Would you rather help others through health and safety programs? Become CPR/AED certified, or train candidates to become instructors. If you prefer the action packed world of lifeguarding, there are opportunities for lifeguard training; and for those who prefer spending their time with little ones, we offer babysitting certifications. We love that we are able to provide these trainings, and can’t wait for our members to participate!